XAML is mostly designed for instantiating and initializing objects. But often, properties must be set to complex objects that cannot easily be represented as XML strings, and sometimes properties defined by one class must be set on a child class. These two needs require the essential XAML syntax features of property elements and attached properties. These two ways to specify the TextColor property are functionally equivalent, but don't use the two ways for the same property because that would effectively be setting the property twice, and might be ambiguous. Label is an object element. 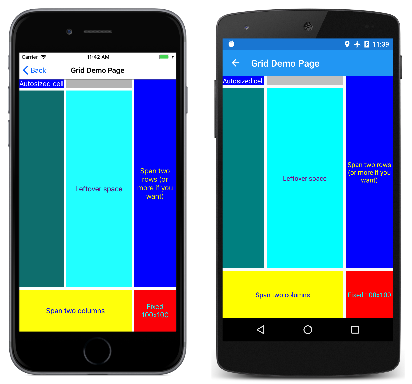 It is a Xamarin.Forms object expressed as an XML element. Text, VerticalOptions, FontAttributes and FontSize are property attributes. They are Xamarin.Forms properties expressed as XML attributes. In that final snippet, TextColor has become a property element. It is a Xamarin.Forms property but it is now an XML element. The definition of property elements might at first seem to be a violation of XML syntax, but it’s not. The period has no special meaning in XML. To an XML decoder, Label.TextColor is simply a normal child element. In XAML, however, this syntax is very special. One of the rules for property elements is that nothing else can appear in the Label.TextColor tag. The value of the property is always defined as content between the property-element start and end tags. At first, property-element syntax might seem like an unnecessary long-winded replacement for something comparatively quite simple, and in these examples that is certainly the case. Another example: The Grid has two properties named RowDefinitions and ColumnDefinitions. These two properties are of type RowDefinitionCollection and ColumnDefinitionCollection, which are collections of RowDefinition and ColumnDefinition objects. You need to use property element syntax to set these collections. Notice the abbreviated syntax for defining auto-sized cells, cells of pixel widths and heights, and star settings. You've just seen that the Grid requires property elements for the RowDefinitions and ColumnDefinitions collections to define the rows and columns. However, there must also be some way for the programmer to indicate the row and column where each child of the Grid resides. These two attributes have default values of 1. <Label Text="Span two rows (or more if you want)"
The Grid.Row and Grid.Column settings of 0 are not required but are generally included for purposes of clarity. Judging solely from the syntax, these Grid.Row, Grid.Column, Grid.RowSpan, and Grid.ColumnSpan attributes appear to be static fields or properties of Grid, but interestingly enough, Grid does not define anything named Row, Column, RowSpan, or ColumnSpan. Instead, Grid defines four bindable properties named RowProperty, ColumnProperty, RowSpanProperty, and ColumnSpanProperty. These are special types of bindable properties known as attached properties. They are defined by the Grid class but set on children of the Grid. When you wish to use these attached properties in code, the Grid class provides static methods named SetRow, GetColumn, and so forth. But in XAML, these attached properties are set as attributes in the children of the Grid using simple properties names. Attached properties are always recognizable in XAML files as attributes containing both a class and a property name separated by a period. They are called attached properties because they are defined by one class (in this case, Grid) but attached to other objects (in this case, children of the Grid). During layout, the Grid can interrogate the values of these attached properties to know where to place each child. For something like this, you might question the wisdom of using XAML. Certainly, the repetition and regularity of the LayoutBounds rectangle suggests that it might be better realized in code. That’s certainly a legitimate concern, and there’s no problem with balancing the use of code and markup when defining your user interfaces. It’s easy to define some of the visuals in XAML and then use the constructor of the code-behind file to add some more visuals that might be better generated in loops. In the previous examples, the StackLayout, Grid, and AbsoluteLayout objects are set to the Content property of the ContentPage, and the children of these layouts are actually items in the Children collection. Yet these Content and Children properties are nowhere in the XAML file. The real question is: Why are these property elements not required in the XAML file? This means that the Content property-element tags are not required. Any XML content that appears between the start and end ContentPage tags is assumed to be assigned to the Content property. That allows content of the layout to be automatically added to the Children collection without explicit Children property-element tags. Other classes also have ContentProperty attribute definitions. For example, the content property of Label is Text. Check the API documentation for others. With property elements and attached properties, much of the basic XAML syntax has been established. However, sometimes you need to set properties to objects in an indirect manner, for example, from a resource dictionary. This approach is covered in the next part, Part 3. 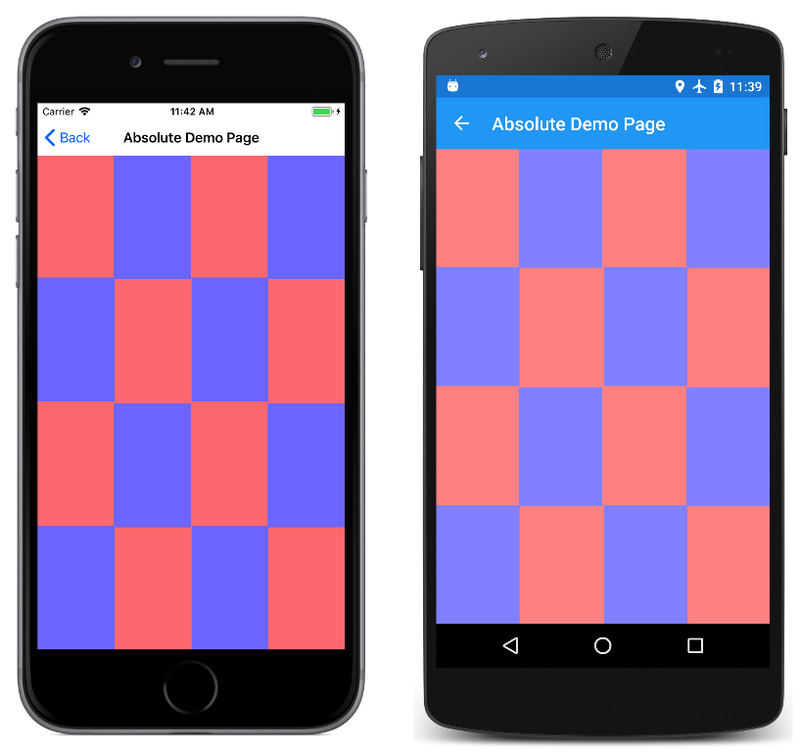 XAML Markup Extensions.